Hello! I like the vapour action feature of the Electrolux Time Manager! 🙂 My 6mo old baby girl has sensitive skin and we take time to iron her clothes after washing them as an added step to make sure the clothes are disinfected and safe to wear. But with the vapour action of the Electrolux Time Manager, we don’t have to do that anymore since this feature helps reduce allergens in clothes by 99.9%! With this feature, my baby is safer and healthier. No itchies! 🙂 and I’ll be saving electricity since I won’t be ironing her little onesies and jammies anymore. And since I won’t be ironing anymore, I’ll have more time to spend with Bettina and take care of her other needs. We will have more time to play and read and just focus on her development. 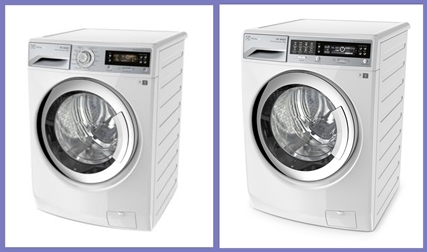 How I wish aquiring the Electrolux Time Manager washing machine is easy as one, two, three. 🙂 it’s definitely a home investment worth buying. Olga! I’ve always had a washing machine until the last one broke down before we moved out of Ortigas. And although it didn’t have much time-saving features, it helped with some of the wash load. The Electrolux Time Manager is a dream machine, especially since I only have one househelp, who currently has her kids with her. So she can’t get much done taking care of her two toddlers, plus mine. The Electrolux Time Manager would allow her to do other chores while not worrying much about the washing because it is like having a second helper around! Who wouldn’t love to save time, energy and water? Definitely, a load sensor will help me budget these three. Not to forget the vapour action feature that reduces allergens in clothes. Having an asthmatic daughter, this would lessen my worries especially that it’s the nanny who washes our clothes. All in all, it’s a great giveaway and if ever, I win, I’d surely volunteer myself do our laundry which I never heehee! More power on your blog and to Electrolux! I am the breadwinner and I consider myself as the head of the family. Yes, it is so hard to earn money these days that is why I keep on make a list of all the expenses that we have every month and check if we can save something from erasing the unnecessary expenses that we have incurred. Having the LOAD SENSOR in washing machines such as what the Electrolux Time Manager has. It saves time, energy and water and thus it saves me MONEY. If I have the Electrolux Time Manager I will use my EXTRA TIME that I will have to spend with my kids. Perhaps play with them, read them a book and teach them about their assignments. Having EXTRA TIME means having more time with them. I collect MOMENTs. For a house-mom like me, to have this will surely be a hit…This is truly an annovative product electrolux has manufactured. It will make washing clothes easier in a lot of ways. I hope to win, or whoever gets it, would have a better and cleaner life, wow! I will use the extra time, money, effort I’d save to my children, would mean more time to teach/helps them with the assignments, more time to talk and giggle, more time to play board games, more time and money to spend wisely to a cherish moment of family bonding. A washer that reduces allergens in clothes by up to 99.9% would be mom’s great partner in ensuring a germ-free clothes for the little ones. I super like the vapour action feature of Electrolux Time Manager as I have two toddlers with sensitive skin. Our washing machine is still in good condition but Electrolux Time Manager is very much welcome in our household. I wonder how much is the price of this washing machine? I want to save up and buy one haha 🙂 I like all the features and even though I know it will cost more than topload washing machines, I think in the long run I can save more if I will use this. Right now I don’t have Electrolux appliances but im really saving money so I can buy new washing machine with heavy duty load. And my first priority on the brand is Electrolux!!! What is your favorite feature of the Electrolux Time Manager? I love the refresh cycle as it lessens the wrinkles in the clothes(I am not a fan of ironing) and I also like the time manager because of the time options depending on the load and on how dirty the clothes are. I’m a 52 year-old mother of four boys, the only one doing the household chores the whole day. if by chance i will be the lucky one to have this Electrolux time manager I would be very grateful for i can have sufficient time to rest because of the refresh cycle feature of the Electrolux Time Manager. I don’t need to iron every washed clothes, that I can be able to make my stiff fingers relaxed longer. It will lessen my load that makes my feet numb for doing chores at home. I’m just a simple homemaker that as early as now I’m giving my thanks to Electrolux for this new product. – I love the refresh cycle as it relaxes the fibres and steams out the wrinkles in your clothes. Just like hitting 2birds in one stone. Saving time and money. Electrolux Time Manager is really a great reward for every mother like me. – I will definitely use my extra time bonding with my son, playing and doing school works. Love it !! My Mom and I would always do the laundry every Saturday since it’s the only time in the week that both of us are free. We would rather do the laundry ourselves than let others do this. We definitely refused to send our clothes to some random laundry shop because honestly they do a bad job cleaning our clothes. In fact, instead of cleaning it, they make things worse. The colours of the clothing will fade and our white clothes turned to yellowish dirty white. Of course, this is not acceptable since they are shortening the life span of the clothes (in terms of quality). And my Mom, being an OC, would rather manually wash our clothes than let some stranger do the job. Doing laundry every Saturday is very stressful since we are washing 1 week worth of clothes. Imagine the bulk of it! 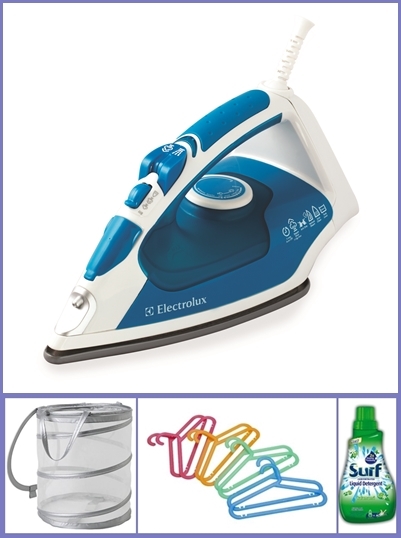 With the help Electrolux Time Manager, I definitely feel it will lighten the load of washing the clothes. The first feature that I liked in the Electrolux Time Manager is the extra wide door. Since we wash the laundry weekly, we are talking about large quantity of clothes. With this, we won’t have any trouble transferring clothes to the washing machine. With the help of the Load Sensor, we can easily see how many detergents and water we need to put in. It’s definitely a cash saver in the long run since the majority of the expenses right now like the water and electricity is sky rocketing these days. Since being an OC person myself I tend to over wash a clothes since I want it to be totally clean and as a result I injured my fingers by doing it. With the help of Lily Drum, I will be assured that all the clothes that got in the washing machine are really, really clean. I can finally avoid damaging my fingers! During our washing day, it’s always a rush to finish everything by morning since we are running after the sun. But with Electrolux Time Manager, I’m sure our Saturday morning will definitely changed a lot. We can have more time relaxing and enjoying the weekends without all the hassle of washing. I have to admit Electrolux Time Manager is definitely a dream come true to all women out there who takes washing laundry as a serious business. I love the refresh cycle as it lessens the wrinkles in the clothes(I am not a fan of ironing) and I also like the time manager because of the time options depending on the load and on how dirty the clothes are. for a house wife like me, with a 6 months baby . to have this will surely help me a lot…This is truly an innovative and useful product Electrolux has manufactured. It will make washing clothes easier. I hope to win, So I can speed more time for my baby. I have only 2 days to be with my baby in a week. vapor action for silky smooth clothes. More time to read your blog. I like the Refresh Cycle since I do not have to iron our clothes afterwards. But I looooove all the features! Since I am a work at home mom, I have to admit that I am having a hard time balancing my work and taking care of him. Work, household chores and keeping an eye on Elijah is hard. It is either I have to give up my work or get a household help so they can do all the chores so I will have extra time for my kid. Having the Eletrolux Time Manager will not only give me enough time to bond and play with my kid but I also I do not have to worry on having wounds because I am washing our clothes by hands cause my washing machine is not working anymore. One of the most monotonous, wearisome and boring household chores for me is doing laundry. Most of the time or all the time I allocate major amount of my valuable time doing the laundry. So it makes me excited learning about this new product and its features. the vapour action feature of this washer floored me! it ought to come handy especially for mums with kiddos that have sensitive skin. a very nifty feature that i thought all washing machine manufacturer should include in their products! For me definitely the “Load Sensor”. It not just detect the load of your clothes it also helps you to recommend the right amount of cycle and detergent which will save you time, energy and water. With that, you have more time for family than doing the laundry which is really great! Time Manager! It it the one responsible for ensuring that time is saved and the washing machine is doing its job for the appropriate type of clothes. The best feature of Electrolux Time Manager is that it is energy and water efficient. Water and energy efficiency should be a priority for us already because everytime i see our monthly bill for meralco and maynilad, i want to faint like the rates are really unbelievable but ofcourse, i am guilty because i know i turned on the appliances and used them because i dont want to deprive my family and myself the conveniences in life. So, i believe the best solution to my dilemna is not to cut the usage down but getting more energy and water efficient appliances instead. I have to start thinking for the long run. not short term savings but making quality investments such as the Electrolux Time Manager. You got me at the “Refresh Cycle” feature.. i hate to admit it.. I am the labandera and the one who folds our clothes. My mom always complains that her clothes are always “lukot lukot” even if I already folded it with extra care. With that awesome feature, I might be getting less complaints and more praises if we have that Electrolux Time Manager Washing Machine. I like the refresh cycle most, simply because it lessens my burden in ironing the family’s clothes. I have 3 kids and 2 grandchildren.. Our labandera hates to iron so I am the one who irons the clothes. Having this electrolux machine would be a great addition to our home appliances and it will save us money too. WOW! The new Electrolux Time Manager Washing Machine has extremely amazing features with the latest technology that helps Mommies, and even daddies like me, to save more time doing laundries while doing other household chores and spend more time with the kid/s. It does not only save time, but also saves energy that uses less water. That’s surely a big rip-off to the household expenses! Indeed, I truly love all its features. But if I have to pick one feature, I consider “Vapour Action” on top of my preference knowing it helps reduce allergens in clothes about 99.9%, which is of course, a great relief because I, my wife, and little daughter have allergies. This machine is undoubtedly worth a try knowing its useful features and functions. My favorite feature of the Electrolux Time Manager is Its Time Manager feature itself because it helps me manage my laundry time so I can do things that matter most. I’d love to have all the features of the Time Manager. the Time Manager actually uses less water and less electricity. That means, you not only save time but also utility expenses while conserving water and energy. Unfortunately, I can’t afford it at this time. I tend to forget my laundry when I’m busy working at the computer, which tends my water to overflow, or have less clothes laundered for the day. If I have the Electrolux Time Manager, I can really multitask laundry and other tasks, especially work-related and craft-related. I love the Vapour Action the most. I have a 16-month old toddler. Mothers like us doesn’t like our kids to wear clothes with allergens clinging on it, right? So this feature is really impressive. To add to that, I have skin asthma. I really need an ally like this to combat allergens. Washing clothes take so much of my time and I hate leaving my son fastened on his stroller. If I have an awesome washing machine like Electrolux Time Manager, I’d probably spend my extra time playing with my son. I chose the Load Sensor feature on top of my preference. Saving is on my vocabulary since I become a mom months ago. Being a young mom like me, should learn to save. I’m a practical mom who weighs every inch of things that come my way. I am really strict when it comes to decision making most specially about my family. The Time Manager actually uses less water and less electricity. That means, you not only save time but also utility expenses while conserving water and energy. You help yourself while helping our Mother earth too! Plus, you can spend more with your precious time with your loved ones. This machine is undoubtedly worth a try knowing its useful features and functions. Your penny used in buying electric washers like this would be in maximum use. My favorite feature of the Electrolux Time Manager is the load sensor! With that feature i don’t have to make estimates on how much i should be loading the machine and it helps me save soap, water and energy at the same time! With the Electrolux Time Manager, my extra time will be wisely spent with my two kids – playing, learning new things and exploring the big world around them! I believe I speak for everyone when I say that we’d be totally missing the point if we said that the best feature of the Electrolux Time Manager is one of either its Loading Sensor, Vapour Action, Refresh Cycle, or others. Its best feature, I believe, is already in its name—IT SAVES TIME! Like you, my wife and I have no househelp AND have only a twin tub washing machine. But unlike you, we don’t have kids yet—but we wouldn’t want to wait until we do before we get a washing machine as amazing as this. As it stands, my wife and I help each other with the household chores—and that includes washing our clothes. To cut the long story short, she washes and spins them while I hang them dry. (Yes, I know, there may be a reversal of roles here, so please don’t hate me.) As much as we are able to half the time it takes for us to wash our clothes this way, we still end up tired and too exhausted to do anything else but take a breather only to realize that we already have to prepare our lunch. Hello there! A washing machine that makes washing less of a chore? 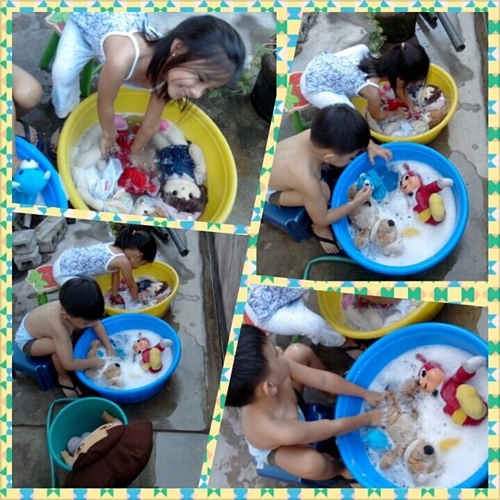 Its definitely a must for a stay at home mom like me, with three little angels under my care, it will surely bring much needed help not just to me but to all those who’s in charge of the laundry in the family. Washing clothes is really a tedious task, its better when im just washing small and light pieces of them but sad to say, I cannot stop curtains, bed sheets, comforter, bath towels and other heavy items to get dirty too. This really became a not so pleasant moment for me, and im sure for all of us whose doing the laundry. One more thing, its unavoidable not to wash them unless I chose to just throw them away after use and buy new ones again afterwards. Electrolux time manager is too good to be true, one product worth having. I must say that all of its unique features are all my favorite, I cannot chose one or two, I simply love them all to act upon my wash loads simply because they all answer my top concerns and needs when it comes to doing my laundry, unlike my twin tub semi automatic washing machine wherein it ate up most of my precious time every time i wash our clothes. Just like other mom I love all the awesome feature of the Electrolux Time Manager but I must say I have myravorites and these are the Vapour Action and Refresh Cycle. As a mom I only wanted the best for my daughter, that’s why I started to make a greener choice as soon as I discovered that I Was pregnant. The vapour action feature will definitely help me reduce allergen my little C’s clothes and cloth diaper. And refresh cycle, it’s an awesome feature. I mean by only using the electrolux time manager washing machine I’m already conserving water and energy and with the help of refresh cycle feature it will trim down the use of iron– so another save up in energy. in that way, you’ll have more time w/ your love ones instead of eating up those time studying how the product works. Refresh Cycle for me, this cuts out my ironing time by at least half, with the time i saved ironing I will be able to enjoy more fun filled activities with my family. Less time doing the laundry, more happy times with the family. Hello to all! Thanks for I happened to knew about your very informative FB Page from a friend. Im a 36 year old plain housewife, a mother of two and currently suffering from a burden of washing clothes manually since our washing machine broke down a month or two ago. That is why, I exactly knew and experience how to wash tons of laundry from morning till its almost night time ( By the way I do the washing every week or sometimes twice a week) and can’t focus on it continually for I have so many roles to attend to, being the sole individual to take care of all the house chores. It’s a pain in the neck, so hard and too exhausting to get the laundry done every now and then really. Currently, I’m on the process of saving for me to buy a new washing machine and i’m just glad that i’ve read about Electrolux Time Manager from your blog. Thank you Olga for posting about this wonderful breakthrough. Hubby and I have been looking for a front load washing machine as this will be a space saver in our little condo unit. I think this Electrolux Time Manager will be a great buy considering all the features. Each one you listed above is equally important to me. Though time or speed is the number one criteria on my list when looking for any techie gadget/machine. Being a full-time homeschooling mom, my time is consumed on making sure my son Cali is doing his work. Now that my trusted all-around helper is gone, I’m the official cook in the house. Take note that I’m still learning how to cook. Nursing my 9-month old daughter is also part of my everyday adventure. The Time Manager is an exceptional feature that will let me adjust as to how quick/slow I want the washing should be done. The Load Sensor and IQ Touch will help me as a newbie to learn how best I can save time and energy. When there are no helpers around, I start ironing hubby’s uniform at 12am after cleaning the room. The Refresh Cycle is a big PLUS on saving not just electricity but my effort too just to get all chores done. Just a few days ago, I had Cali checked by a derma. He’s got dry & very sensitive skin. With the Vapour Action feature, I feel more comfortable that he’s protected 99.9% from allergens. The Leaf Lifter & Lily Drum are features that give me confidence in doing machine wash. Being so OC, I usually repeat handwashing my daughter’s clothes and cloth diapers after seeing/feeling that they’re not clean enough for her. I must say that this new Electrolux washing machine is a must-have for me. I hope I can quickly save for one. I’ll use the extra time to have more “me” time, like reading books, or learning to make desserts for my dear loved ones..